"Hey, A rainy Christmas to you". "Same to you". That's a rather appropriate greeting today as Dominicans endure the rainiest Christmas for decades. 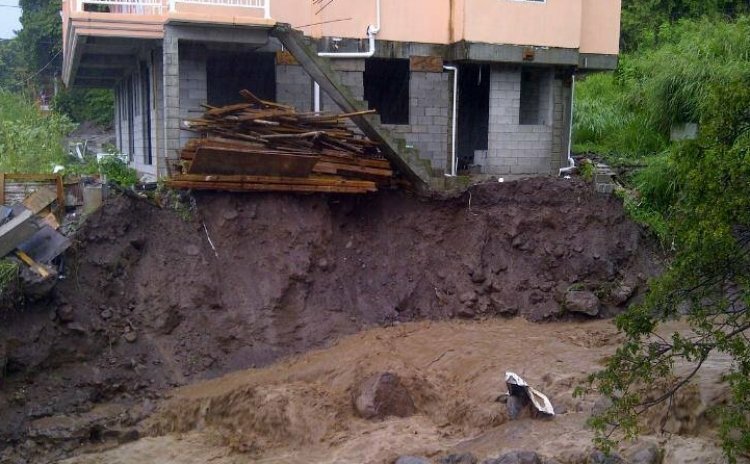 Don Coriette, the Acting Disaster Management Coordinator has reported that a trough generating persistently heavy heavy rains left a trail of disaster in the south of Dominica on Christmas Eve. And more rain is expected on Christmas day and even the day after. At six this evening Coriette told DBS news that assessment of the damage is still being collated and when it is completed it will be passed on to Reggie Austrie, the acting Prime Minister. "A number of household have been affected in the southern part of the island, mainly from Scottshead all the way back to Roseau. The hardest hit areas are Newtown, Citronier and Leopoldville," Coriette said. Coriette added that heavy duty equipment was busy today clearing rock falls in the Roseau Valley area. But the rains will keep Dominicans indoors with family and friends as they savor Christmas specials like sorrel and ham and ginger beer. "According to the Met office we are expecting additional rain overnight as the trough system lingers on and it's likely to continue tomorrow into Thursday," Coriette said. "We asking, again, people living in flood-prone areas, mud-slid and rock-fall areas, to exercise extreme caution and if necessary to move towards to a safer location if your house is compromised." Meanwhile, Ambrose George, the Member of Parliament for Roseau South said it was the first time that he had experienced that level of destruction from rain in the New Town area. "It's a sad moment for all of us," said George as he counted the loss that many residents have experienced. Joshua Francis, the UWP Roseau South candidate was also counting the cost: "We must be very grateful that there was no loss of life, we must acknowledge, however we have suffered severe losses as some of us have lost our houses and the contents thereof". He added: "We should respond with strength and resilience, neighbours must help neighbours, that is what our Roseau South Constituency and Dominica is all about". As the rains pounded the south, many residents there will spend tonight without power. Earlier in the day the area from Castle Comport to Delices was and without power for most of Tuesday. But power has now been restored. But Adina Bellot-Valentine DOMLEC's public relations officer, said homes from the end of point Michel to Soufriere will be without electricity tonight and possibly tomorrow.